I can let the cat out of the bag now! 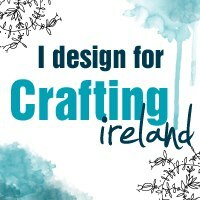 I am on the new Crafting Ireland magazine design team. I am so excited to be on this team of very talented women, and I am looking forward to the next few months. Look out for our first projects in the March edition of the magazine. For those of you who don't know about it, Crafting Ireland is an on-line magazine, published monthly. If you would like to subscribe head over to the Crafting Ireland where there is a link to the magazine and a place to subscribe so that you never miss a thing.